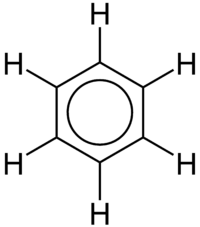 Benzene, with the delocalization of the electrons indicated by the circle. In chemistry, delocalized electrons are electrons in a molecule, ion or solid metal that are not associated with a single atom or a covalent bond. The term is general and can have slightly different meanings in different fields. In organic chemistry, this refers to resonance in conjugated systems and aromatic compounds. In solid-state physics, this refers to free electrons that facilitate electrical conduction. In quantum chemistry, this refers to molecular orbitals that extend over several adjacent atoms. In the simple aromatic ring of benzene the delocalization of six π electrons over the C6 ring is often graphically indicated by a circle. The fact that the six C-C bonds are equidistant is one indication of this delocalization. In valence bond theory, delocalization in benzene is represented by resonance structures. Delocalized electrons also exist in the structure of solid metals. Metallic structure consists of aligned positive ions (cations) in a "sea" of delocalized electrons. This means that the electrons are free to move throughout the structure, and gives rise to properties such as conductivity. In diamond all four outer electrons of each carbon atom are 'localized' between the atoms in covalent bonding. The movement of electrons is restricted and diamond does not conduct an electric current. In graphite, each carbon atom uses only 3 of its 4 outer energy level electrons in covalently bonding to three other carbon atoms in a plane. Each carbon atom contributes one electron to a delocalized system of electrons that is also a part of the chemical bonding. The delocalized electrons are free to move throughout the plane. For this reason, graphite conducts electricity along the planes of carbon atoms, but does not conduct in a direction at right angles to the plane. Standard ab initio quantum chemistry methods lead to delocalized orbitals that, in general, extend over an entire molecule and have the symmetry of the molecule. Localized orbitals may then be found as linear combinations of the delocalized orbitals, given by an appropriate unitary transformation. In the methane molecule for example, ab initio calculations show bonding character in four molecular orbitals, sharing the electrons uniformly among all five atoms. There are two orbital levels, a bonding molecular orbital formed from the 2s orbital on carbon and triply degenerate bonding molecular orbitals from each of the 2p orbitals on carbon. The localized sp3 orbitals corresponding to each individual bond in valence bond theory can be obtained from a linear combination of the four molecular orbitals.